It is a knife blacksmith made by traditional style. 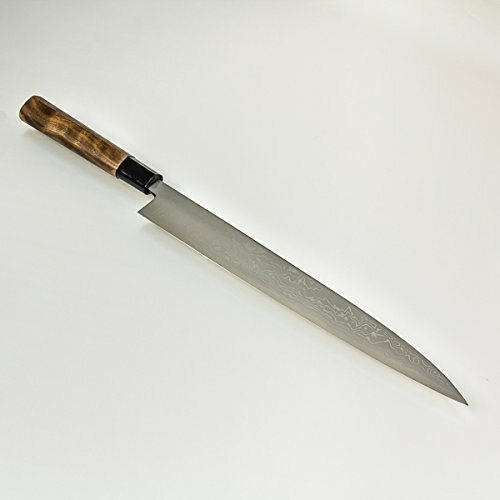 Aogami No 2 Steel is a superlative steel for professional knives. So it is extremely sharp and sharpness lasts longer. However,it gets rust easily so it needs maintenance . Beautiful Lamination Layer Pattern. The pattern appears by forging lamination layer. Attention : The blade is attached by hammering to the wooden handle. At that time, as Nakago of blade is heated quite high, there could be small cracks at the top of the handle. No problem for use, but we do not recommend this for those who do not like those cracks, Wa- Handles are easily replaced so that we can keep using fine blades for a long time. Made in Japan ! Handmade by Tosa Craftsment! We do not recommend this for those who do not like small cracks of handle, or who do not like small scratches.